A mermaid (from the Middle English mere meaning "sea" and maid, meaning "girl") is a legendary aquatic creature with the head and torso of a human female and a fish-like tail. The male version of a mermaid is known as a merman, and the gender-neutral plural is merfolk or merpeople. Merfolk appear in a plethora of cultures worldwide—legends often tell of mermaids singing to sailors, enchanting them, and luring them to their death. The origin of the mermaid legend is often traced to the manatee or dugong, large aquatic mammals that can sometimes have human-like characteristics. While there have been many who claim merfolk are real, all "evidence" of their existence has thus far proven to be a hoax. Yet the image of a beautiful human-like creature that is at home in the water continues to attract us, reflecting our desire to have dominion over all aspects of the natural world. Tales of these half-human, half-fish legendary creatures have circulated for millennia, and many of the oldest can be found in ancient mythology. Although long-lived and possessing supernatural powers, merfolk are generally depicted as mortal and without an eternal soul. Ancient Babylonians worshiped a sea god named Ea, and merpeople feature prominently in Polynesian mythology. Ancient Syrians worshiped a mermaid moon-goddess called Atargatis, sometimes called Derceto. In the second century, Lucian of Samosata on Syria described Derceto in De Dea Syria (Concerning the Syrian Goddess), saying: "I have seen the semblance of Derceto in Phœnicia, and a wonderful sight it is; one half is a woman, but the part which extends from the thighs to the feet ends in a fish's tail." Merpeople were often present in Greek mythology. The sea god Triton, son of the King and Queen of the Sea, Poseidon and Amphitrite, is usually depicted with the upper torso of a man and a fish's tail. The sirens that attempt to lure Odysseus to his death in The Odyssey were originally portrayed as half-female, half-bird, but later depictions portrayed them as mermaids. Another notable merman from Greek mythology is Glaucus. According to legend, Glaucus was born human and lived as a fisherman. One day, while fishing, he noticed that the fish he had caught were reviving and finding their way off the land and back into the sea. He ate some of the grass the fish had been lying on, believing it to have magical properties, and felt an overwhelming desire to be in the sea. He jumped in the ocean, where the sea gods transformed him into a merman. Ovid related the transformation of Glaucus in his Metamorpheses, describing him as a blue-green man with a fishy member where his legs had been. Merfolk are found in the folklore of most parts of the world. In Japan, it is said that eating the flesh of a mermaid can grant immortality. Icelandic folklore tells of mermen known as Marbendlar, and tales of mermaids and mermen were often found in the folklore and legends of the British Isles. Mermaids were noted in British folklore as ominous: foretelling disaster as well as provoking it. Some were described as monstrous in size, up to 160 feet. Mermaids could also swim up rivers to freshwater lakes. As one legend goes, the Laird of Lorntie thought he saw a woman drowning in a lake. As he went to aid her, a servant pulled him back, warning that the woman was actually a mermaid. The mermaid then screamed that she would have killed him if it were not for his servant. In Irish folklore, tales of mermaids tend to be more romantic. It was believed that mermaids could transform into human form through the removal of a cap or sea-skin. Instead of mermaids who lure men to their death, Irish mermaid legends often tell of men who hide the cap or sea-skin of a mermaid in order to marry them and bring them home. There are several Irish families who claim mermaids as ancestors, and include mermaid images on their family crests and arms. Mermaids were often featured in the decoration of Medieval churches, particularly in the British Isles. Often shown holding a comb and mirror, mermaids not only embodied the sins of pride and vanity, but were also often used to represent the sin of lust. Images of mermaids holding a fish or starfish were used to represent a Christian soul that had been lost to the deadly sin of lust, and were placed in churches to warn churchgoers not to be seduced by such evils. While mermaids are often represented as curious or envious of human life, mermen are most often portrayed as more private and secretive; often they are less attractive than their female counterparts. In Irish legends, for example, mermen are definitively ugly. Stories abound of beautiful mermaids using their enchanting voices to sing to sailors and finding their way close to the world of men, but such stories about mermen are less common. It has been widely suggested that manatees or dugongs could be behind the myth of the mermaid. These large aquatic mammals are notable for the way in which they carry their young, cradled in their arms much as a human would carry a baby. It is possible that sailors seeing these unfamiliar beasts for the first time would assume that they had in fact stumbled across some sort of humanoid species, and consequently spread their accounts of the sightings through their homelands on their return from their voyages. It has even been suggested that the traditional image of a mermaid with long flowing hair could be attributed to manatees breaking the ocean surface underneath patches of seaweed, giving the unfamiliar observer the impression of long hair. In 1493, Christopher Columbus recorded a sighting of what was most likely a group of manatees or dugongs, recording in the ship's log that "when the Admiral went to the Rio del Oro he saw three mermaids which rose well out of the sea… they were not as beautiful as they are painted though they have something of a human face." The most famous mermaid hoax was perpetrated in the mid-nineteenth century by legendary showman P. T. Barnum. The "Feejee Mermaid" was exhibited after Barnum had hired a phony naturalist to support the mermaid's authenticity, and used accomplices to send letters from various cities that spoke of the fake "Dr. Griffin" and his remarkable mermaid. Woodcuts were given to the newspapers, and audiences soon flocked to see the beautiful, seductive creature pictured in the woodcut. Instead, they found that the Feejee Mermaid was a grotesque combination of ape and fish, and not at all what they had expected. 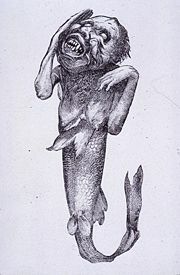 In actuality, the Feejee Mermaid was most likely the creation of a Japanese fisherman sometime around 1810. Such half-fish half-ape creatures were a traditional art form, and were often created for use in religious ceremonies. Though the Feejee Mermaid was the most famous, "mermaids" have been commonly found in carnivals, traveling circuses and side shows. More recently, in the wake of the 2004 tsunami in the Indian Ocean, pictures of "mermaids" were spread through the Internet. It was claimed that the photos were of creatures that had washed up amid the devastation, but the very same photographs had circulated in 2003, and were no more real than Barnum's exhibit. The statue of The Little Mermaid, a monument to Hans Christian Andersen, in Copenhagen harbor. Perhaps the most famous mermaid in literature is found in Hans Christian Andersen's fairytale The Little Mermaid (1836). Translated into many languages, Anderson's tale tells of a young mermaid who trades her voice for human legs in her quest for the love of a prince and the acquisition of an immortal soul. 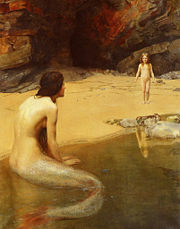 Anderson's portrayal of mermaids has arguably become the standard, and has influenced most modern Western depictions of mermaids since its publication. The story has been retold in numerous adaptations, the most famous of which is the 1989 Disney movie of the same name, where, unlike the original, the Little Mermaid lives happily ever after with her prince. 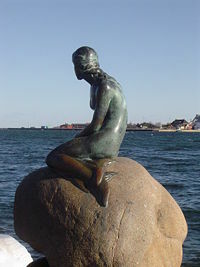 A famous bronze statue by sculptor Edvard Erichsen was given to the city of Copenhagen in 1913, depicting the famous Little Mermaid sitting on a stone in Copenhagen Harbor. Both mermaids and mermen have long been associated with music, and much like that of Orpheus, the power of a mermaid's singing has the ability to enthrall. Stories abound of mermaids who lure sailors to their death with their beautiful, enchanting songs. Along with their legendary vanity, the hair-combing and mirrors, the association of mermaids with music is coupled with another association of a vocal nature: they are said to be able to confer verbal eloquence, much like the Muses of the ancient Greek myths. Though many claim that mermen also communicate through song, tales of mermen's songs are much rarer, as are tales of mermen in general. Mermen are more often pictured making music with a conch shell than singing. Triton, a Greek sea-god, is often pictured with a conch shell trumpet. A Mermaid by John William Waterhouse. Images of mermaids can be found in ancient Greek pottery and mosaic. Many of these mermaids have a split tail; a feature commonly found in ancient concepts of a mermaid's appearance. Mermaids have long been a popular subject with painters. 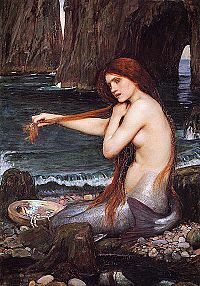 One of the best known mermaid paintings, A Mermaid, was painted by John William Waterhouse from 1895 to 1905. An example of late British Academy style artwork, the piece debuted to considerable acclaim (and secured Waterhouse's place as a member of the Royal Academy). Mermaids are also popular in both literature and film. 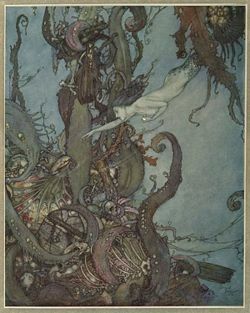 In addition to Andersen's famous fairytale, The Little Mermaid, mermaids have appeared in the novel The Sea Fairies, by L. Frank Baum, James Barrie's Peter Pan, and numerous other works of children's literature and fantasy fiction. In film, mermaids have been the subject of many comedies such as Miranda (1948) and Splash (1984), as well as the famous animated adaptation of The Little Mermaid by Walt Disney. File:POL Warszawa COA 1.svg In heraldry, the charge of a mermaid is commonly represented with a comb and a mirror, and blazoned as a "mermaid in her vanity." Merfolk were used to symbolize eloquence in speech. The official coat of arms of Warsaw, the capital of Poland, features a mermaid wielding a sword and shield. Numerous legends tell the origin of the Warsaw mermaid; the best known describes a mermaid who would tangle the nets of the fishermen. Because of her enchanting singing, the fishermen did not harm her, but a wealthy merchant captured her to display her at fairs. Rescued by one of the town's young men, the mermaid was grateful and vowed to defend the city in time of need. ↑ Victoria University of Wellington, The Origin of the Coconut–A Legend of Manahiki Island Retrieved May 17, 2007. ↑ Lucian of Samosata, The Syrian Goddess.Sacred Texts Retrieved May 17, 2007. ↑ Katharine Briggs. An Encyclopedia of Fairies, Hobgoblins, Brownies, Boogies, and Other Supernatural Creatures. "Mermaids," (New York: Pantheon Books, 1976. ISBN 039473467X), 287. ↑ K. M. Briggs. The Fairies in English Tradition and Literature. (University of Chicago Press, 1967), 57. ↑ Patricia Radford, Lusty Ladies: Mermaids in the Medieval Irish Church Retrieved May 17, 2007. ↑ Thor Janson, Discovering the Mermaids Retrieved May 17, 2007. ↑ Alex Boese, The Feejee Mermaid.museumofhoaxes.com. Retrieved May 17, 2007. ↑ Barbara and David Mikkelson, Mermaid to Order.snopes.com. Retrieved May 17, 2007. ↑ The City of Warsaw, History of Warsaw's Coat of Arms. Retrieved May 17, 2007. Briggs, K. M. The Fairies in English Tradition and Literature. Chicago: University of Chicago Press, 1967. This page was last modified on 16 October 2014, at 17:04.